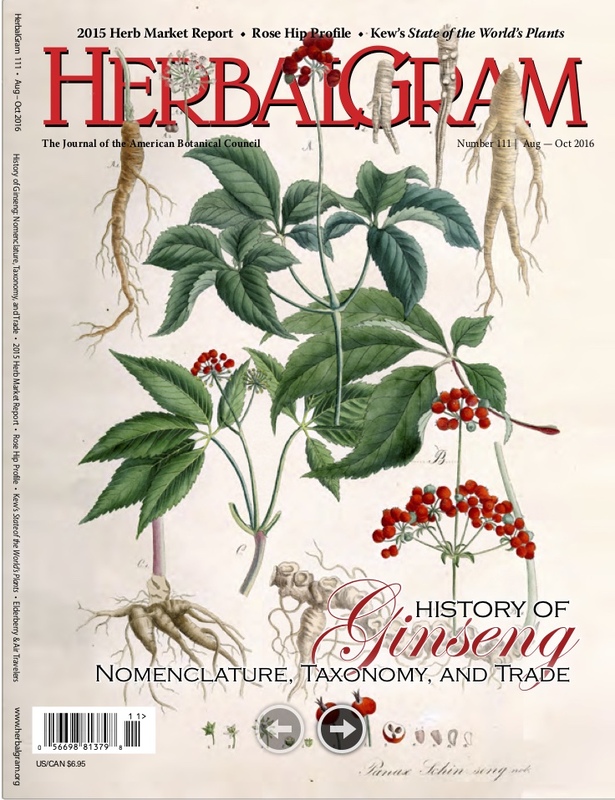 AUSTIN, Texas (August 8, 2018) — August 2018 marks the 35th anniversary of HerbalGram, the quarterly journal of the American Botanical Council (ABC). 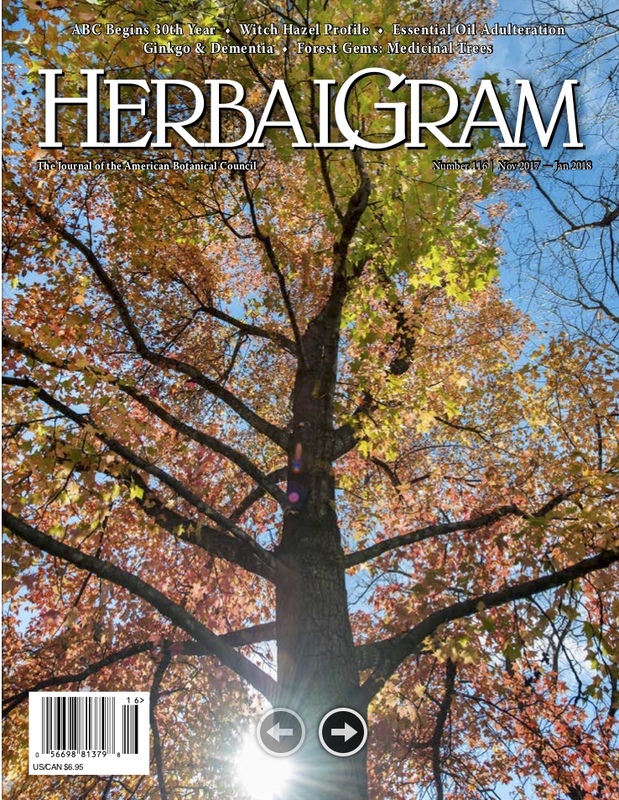 Since its first issue in 1983, HerbalGram has transformed from a black-and-white newsletter to a full-color, 82-page journal with the visual appeal of beautiful botanical photography and intellectual draw of peer-reviewed articles. Though HerbalGram has evolved significantly, its editorial mission to serve as a reliable herbal education resource has remained the same. In the summer of 1983, ABC Founder and Executive Director Mark Blumenthal produced the first issue of HerbalGram, which was then titled “Herb News” with the subtitle “Herbalgram.” Blumenthal, who also was running his former herb distribution business, Sweethardt Herbs, spent many of his nights and weekends collecting, writing, and editing articles for the newsletter. It was this focus on disseminating trustworthy and timely herbal information that would eventually lead Blumenthal to found ABC in 1988. Originally published with financial support from the newly formed American Herbal Products Association (AHPA), of which Blumenthal was a founding board member, the first HerbalGram was an eight-page, black-and-white newsletter stapled at the spine. It consisted of “herb blurbs” on herbal miscellanea, a “media watch” section with herb-related news articles, a handful of paragraph-long “Rob’s Research Reviews” authored by then-Associate Editor Robert McCaleb (who, at the time, was also head of research at Celestial Seasonings), listings of herbal information resources and schools, and more. The editorial staff included just Blumenthal and McCaleb, who also co-founded the Herb Research Foundation (HRF) together. For the second issue, Blumenthal enlisted two additional part-time assistant editors. The publication now featured the title “Herbalgram” in larger font. 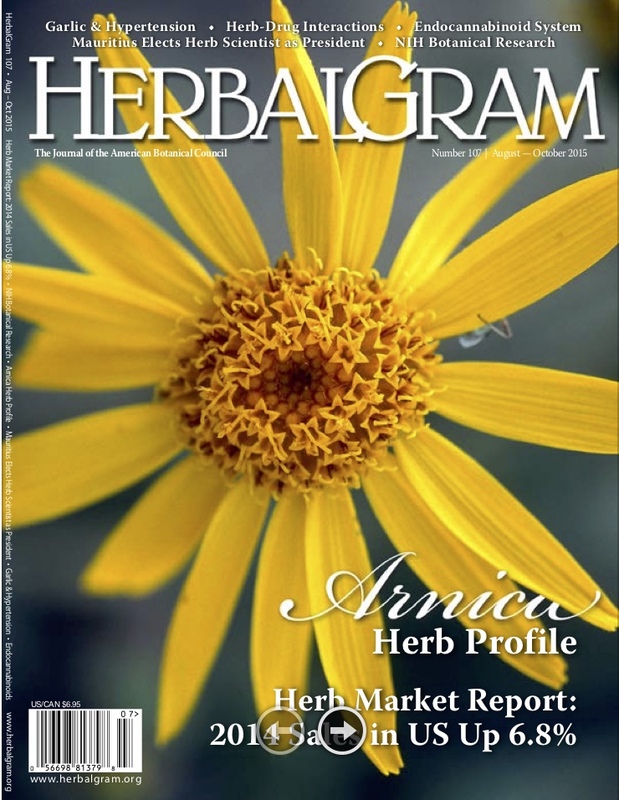 This issue took on a more defined format, with organized sections on industry news, conferences/meetings, HRF news, and “potpourri” — a catch-all section featuring various news items of possible interest to the growing herbal industry and community. In the following years, HerbalGram transformed into a modern force in the botanical medicine community. In 1988, HerbalGram issue 18/19 was the first color edition with a cover illustration of St. John’s wort (Hypericum perforatum, Hypericaceae). This 48-page double issue also was the first published under the auspices of both HRF and ABC, which Blumenthal founded with the late ethnobotanist James A. Duke, PhD, and the late Professor Norman Farnsworth, PhD, in order to help transition the publication from newsletter to journal. In 1992, issue 28 was the first full-glossy, four-color issue, and featured an image of the Ware Collection of Blaschka Glass Models of Plants from the Harvard Museum of Natural History on the cover. The journal increased to its current length of 82 pages in 1999, and, in 2000, issue 50 was the first to be published by ABC alone. Eighteen years and almost 70 issues later, the editorial staff of HerbalGram has grown to include an art director and three full-time editors, in addition to Blumenthal, who serves as editor-in-chief, along with many other employees at ABC who serve in a variety of other important roles. The journal features articles both from in-house writers and botanical experts from around the world, and all are peer-reviewed by members of ABC’s distinguished advisory board or other professionals with relevant expertise. HerbalGramreaches thousands of readers in more than 81 countries who represent a range of diverse professions, from research scientists (e.g., pharmacognosists, ethnobotanists, etc.) and health practitioners (e.g., herbalists, naturopathic physicians, pharmacists, conventional physicians, etc.) to industry members, government regulators, and many others. HerbalGram has been a leader in presenting extensive literature reviews on specific herbs in an effort to help establish a scientific basis for their potential health benefits. In some cases, these reviews can also help clarify erroneous or inappropriate claims about the uses of the herbs. Recent HerbalGram issues have featured significant articles such as issue 118’s pictorial on Joseph Banks’ historic Florilegium of botanical life that was encountered on Captain Cook’s first South Pacific voyage; issue 116’s beautiful and informative deep-dive into medicinal trees of North America; and issue 103’s feature about the effects of climate change on the quality of tea. Each year, HerbalGram also publishes its annual Herb Market Report, which describes the trends of the botanical dietary supplement market in the United States and frequently is cited in other publications. Additional in-depth key articles published in recent issues have included a look into the history and pharmacology of the emerging Southeast Asian tree kratom (Mitragyna speciosa, Rubiaceae); a pet supplement herb market report; notes from a 17th-century ethnobotanical expedition to South Africa; and many more. In 2012, ABC introduced an online “page-flip” version of HerbalGram that is optimized for viewing on smartphones, tablets, and computers. In 2016, all issues of HerbalGram became available in PDF format, from 1983’s issue 1 through the current issue, thanks to a digitizing project overseen by Art Director Matt Magruder in 2016. Before that, only issues 85 and above were available as PDF files. HerbalGram is available as a benefit of ABC membership at the Individual level and up. It also is sold in some bookstores and natural food stores. Dispatch from County Cork, Ireland! Just returned from an Herbal Excursion to the Emerald Isle, sponsored by Cynthia Graham at Nurse Natural Path. Among the many things that I learned is that what you read into your own expectations may not be true. For example, I did not expect any place on earth at 53 degrees North latitude to be harboring palm trees and herbaceous plants from the Amazon. The warm clothes I brought with me proved mostly superfluous, a pleasant surprise, indeed, while basking in the comfort of temperatures in the low to mid 60°F range. 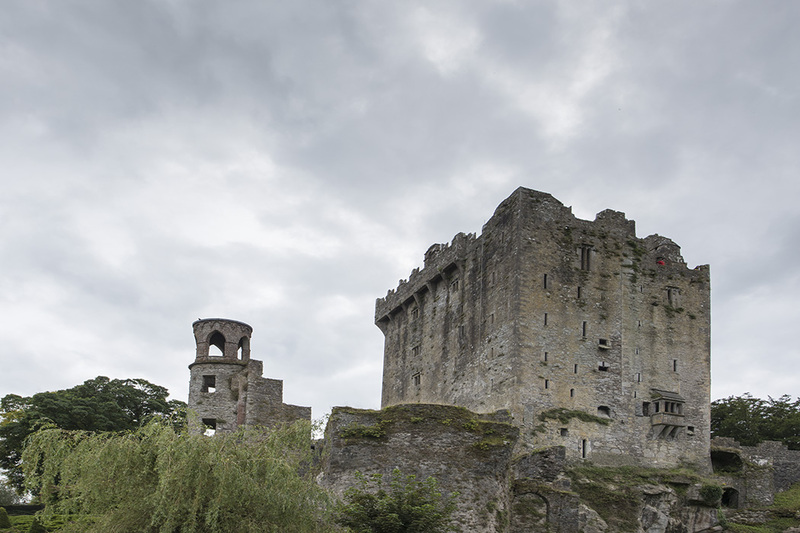 We visited Blarney Castle on 30 August 2015, famous for the Blarney Stone, which one kisses to gain the gift of eloquence and exposure to unknown microorganisms from tourist the world over. The first castle at the site was a wooden hunting lodge built in 1210, which seems old until you consider that some of the stone structures in Ireland were built a thousand years before the great pyramids in Egypt. The present Blarney Castle was built in 1446, so in Irish historical terms, it is a relatively new structure. Please forgive my lack of eloquence as I was too busy looking at the plants around Blarney Castle to stand in line to kiss the Blarney Stone, and as I wrote the intital draft of this article I was well into an evening draft or two of Guinness. Instead, at Blarney Castle, I spent most my two hours at the site in the Poison Plant Garden, which is the only one of its kind in Ireland. I was somewhat amused by the selection of plants in the garden, which included our Ozark native mayapple (Podophyllum peltatum), black cohosh (Actaea racemosa) and skullcap (Scutellaria lateriflora). 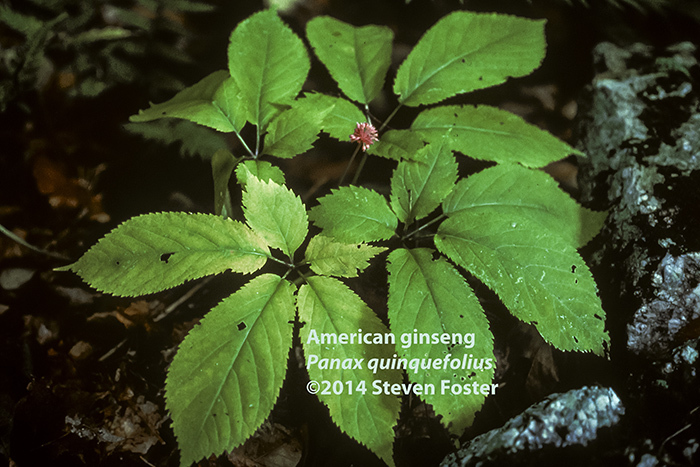 While mayapple has legitimate claims to toxicity, black cohosh and skullcap themselves have no real safety issues except for products bearing their names that have been adulterated with toxic imposters. Nevertheless, by association in the absence of a complete understanding of the literature, the casual observer might think that they have some toxicity. There was a display of our native eastern North American poison ivy (Toxicodendron radicans) imprisoned in a cage with thick iron bars that a grizzly bear looking for a honey-rich beehive could not break-through. 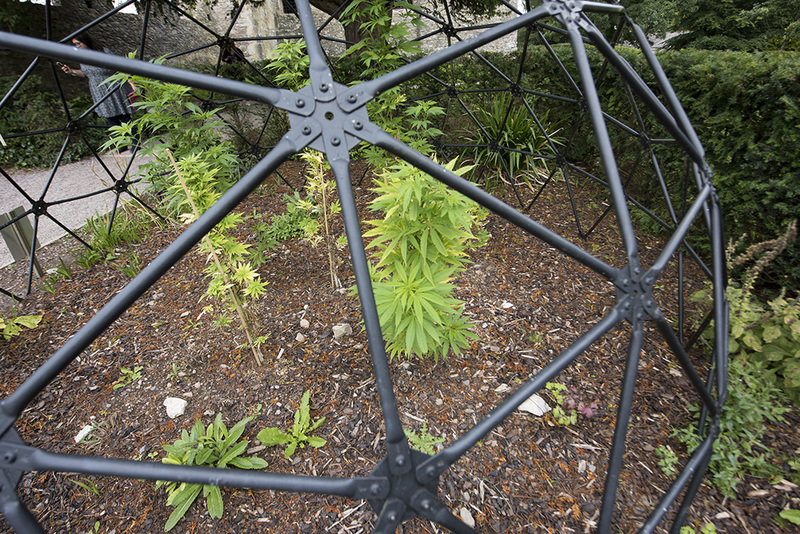 One of my fellow travelers beckoned, “Steven, look at this.” And there at the other end of the garden, beneath what appeared to be a repurposed geodesic dome playground monkey bar were caged marijuana plants. 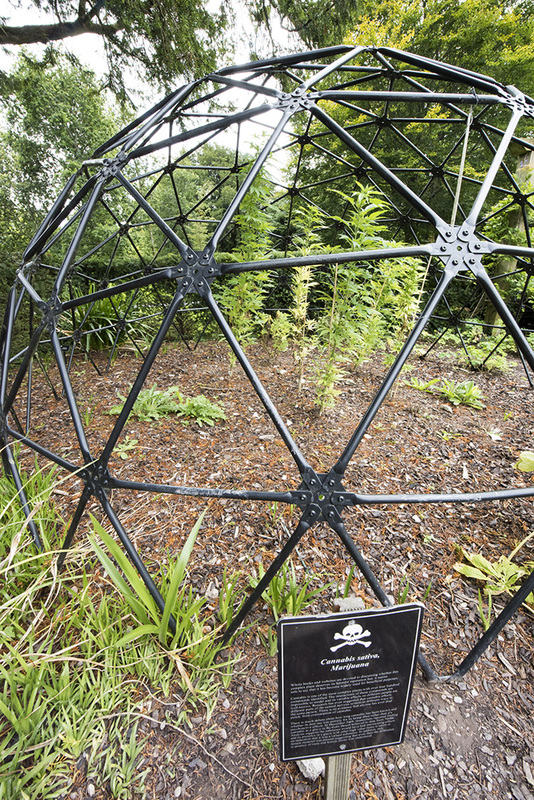 The warning sign was boldly emblazoned with skull and cross bones, a warning of the potential danger of the plant. Hmmm, I thought. 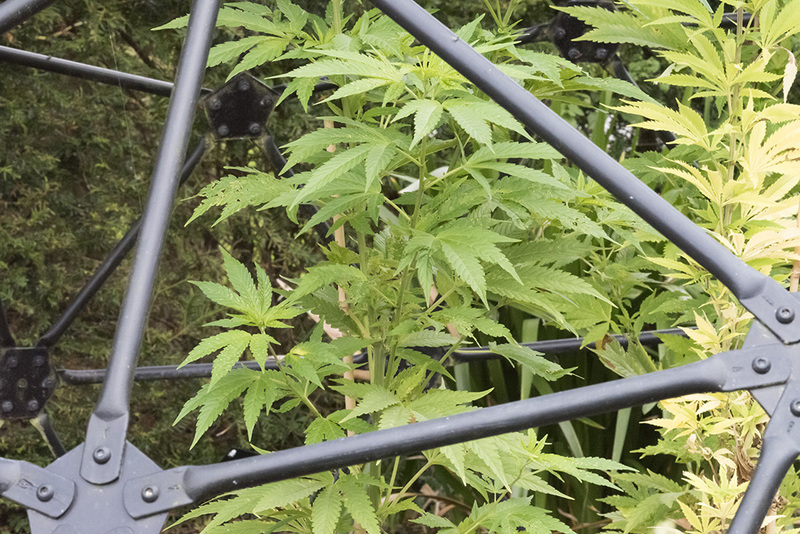 A playground structure as a make-shift cage for marijuana plants? This can only be Irish humor. Tuesday February 3, 2015, the New York Attorney General, Eric T. Schneiderman, issued a press release on an action taken the previous day in which his office delivered “cease and desist” letters to four major retails including GNC, Target, Walgreens, and Walmart alleging that they were selling herbal dietary supplements that did not contain the plant materials listed on the product labels. The herbs included Echinacea, Garlic, Ginseng, St. John’s Wort, and Saw Palmetto. 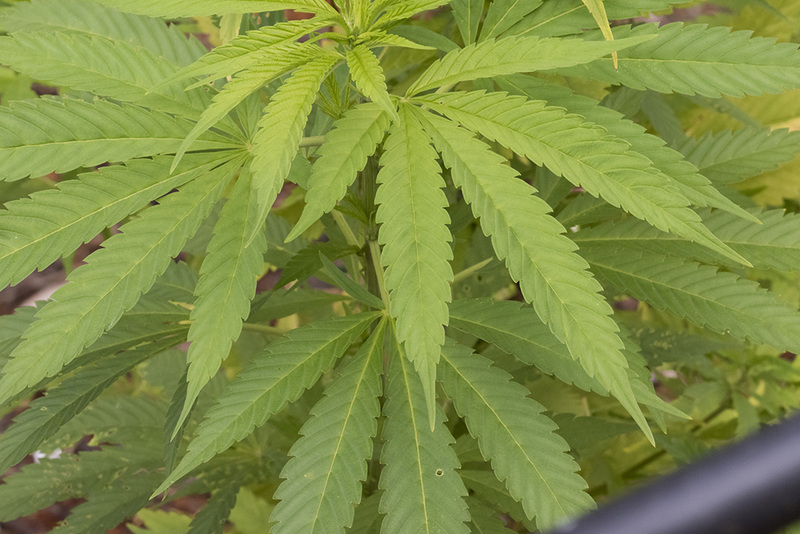 According to the Attorney General’s press release 79% of the products tested, either did not contain the plant material claimed on the label or contained other plant materials not listed on the label. All of the products were “store brands,” made by contract manufacturers. “This investigation makes one thing abundantly clear: the old adage ‘buyer beware’ may be especially true for consumers of herbal supplements,” said Attorney General Schneiderman. “The DNA test results seem to confirm long-standing questions about the herbal supplement industry. Mislabeling, contamination, and false advertising are illegal.” “Seem” is the operative word here. Schneiderman has apparently been watching too many episodes of CSI “city du jour” in which the DNA always solves the crime. 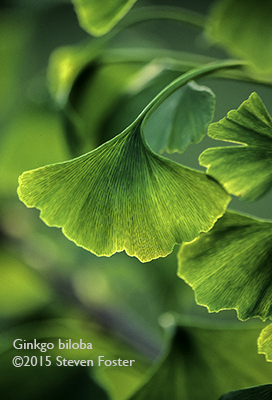 DNA analysis for plants is great for botanicals or plant specimens in which intact DNA still exist, but if you are testing an extracted plant ingredient—PRESTO—the DNA except in rare cases no longer exists! Every qualified, experienced plant analytical laboratory that authenticates botanicals day-in-and-day-out, knows that DNA alone is unreliable for testing plant extracts. Instead validated chemical analytical methods along with other validated lab methods are used. See link at the end of this article to see the American Herbal Pharmacopeia’s 54-page response to Attorney General Schneiderman which includes the appropriate lab methods to i.d. of the plant extracts in question. A retired plant scientist friend mused, “if DNA testing is required for validating plant ingredients claimed to be in any product, the supermarket shelves would be empty.” If Schneiderman had applied the same DNA method to the brown liquid in the cup of coffee he might have drunk before his news conference, the test would have likely shown that his cup of coffee contained no detectable DNA of the coffee plant! A version of this story was published in the Eureka Springs Independent Newspaper in the Nature of Eureka column on 11 February 2015. See response to the New York AG from Roy Upton, Founder and Executive Director of The American Herbal Pharmacopeia, which supplies a rational response to an irrational action. All is not as it seems . . . Nature is clean. Nature is pure. Nature is unspoiled. And if you believe that, I would like to sell you beach front property on the Moon. When we buy something labeled natural or labeled organic, that product or food category, whatever it may be, comes with an underlying expectation of integrity, honesty, truthfulness and reliability. The same expectations holds true for scientific literature, in which a process of peer review, critique of theory, vigilance of methodology and veracity of conclusions assumes that the published findings are upheld at least by the reputations of researcher(s), editor(s), and publisher(s). These are general, if naive expectations and beliefs that we hold that things are what they seem to be. Yes, it’s true. I’m a happy curmudgeon and skeptic. Early in my career, I became intrigued by concepts related to quality, identity, and labeling of herb products. At the time I worked at the Herb Department of the Sabbathday Lake Maine Shaker Community, whose history dated back to the late eighteenth century. When I was there direct expertise in herb production no longer existed. During that time from 1974-1978, I learned by trial and error. We had a catnip tea product. The catnip I grew had a strong, aromatic fragrance, typical of catnip rich in essential oil. We sold more than we were able to grow. We had to buy bulk catnip that turned out to be left over stem and stubble from seed production. No self-respecting cat would respond to a cat toy filled with these floor sweepings. In the company of cats, my homegrown catnip turned me into a feline pied piper. Both samples were catnip, but the quality was dramatically different. I find the same is true of published science—some is high quality. Some science is floor sweepings, created by “experts” in a narrow scientific specialty who think that they can magically transform their methods into areas of other scientific disciplines of which they are clueless, then draw conclusions, in which they prove their lack of knowledge as evidenced by their sloppy work. Would you send an entomologist in space to repair the Hubble Telescope? Of course, pride and reputation machismo prevent the authors and journals from retracting their errors. If there’s a buck to be made, someone is going to find away to make that buck. If you don’t know what it is that you’re buying, the possibility of not getting what you expect increases. With the pressure for academics to publish or perish, I promise you, if your study is rejected by one journal, no problem, as you can always finds a journal happy to take your scientific paper no matter what the quality of the science might be. The bottom line is that you can’t always believe what you read whether it’s at website, words on a product label, “science” in a scientific paper, or reporting on a scientific paper, even if it part of “all the news that is NOT fit to print.” My next post will have the details. I have come to believe that the only published word that is what it seems to be is fiction. 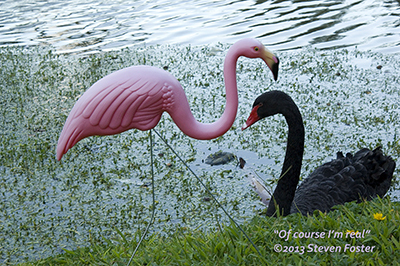 Adapted from my “Eureka Nature” column in the Eureka Springs Independent Newspaper for 6 November 2013. This entry is also an opinion piece sparked by this response to a scientific paper. American Botanical Council Celebrates 25 Years! (AUSTIN, Texas, Oct. 31, 2013) On November 1, the American Botanical Council (ABC) celebrates a quarter century of promoting the responsible, science-based use of herbal medicine. The independent nonprofit’s 25th anniversary is a major milestone for the Austin, Texas-based organization and speaks to its enduring message of informed, research-supported healing through nature — one that has resonated with thousands of members and supporters both locally and in many countries around the world. In the 1980s, when the modern herbal medicine movement was experiencing a revival and consumer awareness and exposure to natural medicine was slowly increasing, ABC Founder and Executive Director Mark Blumenthal saw the need for an authoritative, science-based source of information on botanical medicine to act as a touchstone for herbal education and quality for all aspects of the herbal industry including consumers. The Texan visionary, whose passion for herbal medicine earned him the nickname “Herbal Cowboy,” together with two internationally respected medicinal plant experts — the eminent ethnobotanist James A. Duke, PhD, and the late distinguished pharmacognosist Norman R. Farnsworth, PhD — established the educational nonprofit American Botanical Council in 1988. Continue reading American Botanical Council Celebrates 25 Years! 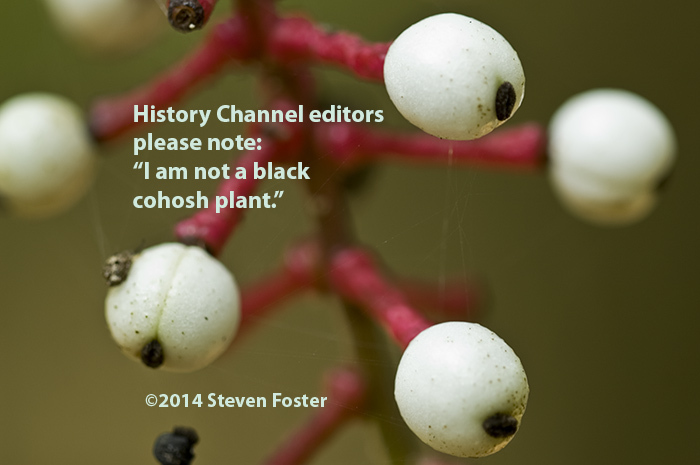 Posted on November 1, 2013 November 1, 2013 Author Steven FosterCategories Events, News about Herbs, Plant PeopleTags ABC, Adulterants, American Botanical Council, HerbalEGram, HerbalGramLeave a comment on American Botanical Council Celebrates 25 Years!